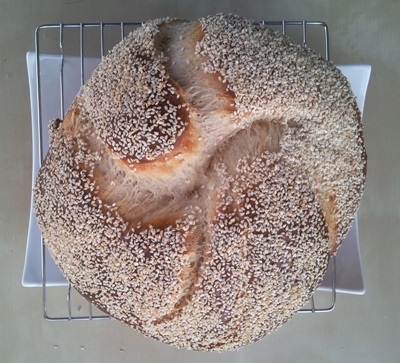 Everyone loves this challah (egg bread). When I put it out at parties, it disappears rapidly, and people always ask for the recipe. This recipe makes one large loaf, two smaller loaves, or approximately 10 burger buns or rolls. The dough is made in the bread maker, but the bread is baked in the oven for a nicer shape and better crust. Add bread ingredients to the bread maker in the order listed. Select 2-pound loaf (large loaf) and dough cycle. When the dough cycle is completed, remove the dough, punch it down, and shape as desired (I shape it into a twist or a braid when I have time; when I’m in a hurry, I just shape it into one or two basic rounds). If you prefer buns or rolls, roll the dough into a tube shape and then slice it into rounds of the desired thickness. Let the shaped dough rise for 45 minutes to an hour for really fluffy bread. If you’re making rolls or buns, a 30-minute rise should be sufficient. Preheat the oven to 375 degrees Fahrenheit (190 Celsius) for bread and 350 degrees Fahrenheit (177 Celsius) for buns or rolls. While the oven heats, glaze the bread with the egg and water mixture. Then sprinkle the sesame seeds or poppy seeds over the top. Bake the bread for 20-30 minutes, or until the crust is golden brown (check for doneness after 20 minutes). If making buns or rolls, check for doneness at 15 minutes; they don’t usually take more than 20 minutes. Serve warm with honey butter (mix 3 parts butter and 1 part honey; add a tiny bit of vanilla and/or cinnamon if desired). Make into french toast with fresh sliced strawberries, maple syrup, and/or whipped cream.